This combo set includes 2 pairs of black and beige to help stop your kids heel pain and walk longer. All the protection you need to help provide sturdiness and stability for your kids foot. With the built in gel silicone, these sleeves helps provide the extra cushioning for your kids while walking or standing. These helps absorb the shock with each step your kid takes, relief from any heel discomfort and pain. Soft and comfortable support of these neoprene sleeve thats thin and fits easily into any shoes. Specially design with the gel silicone protecting the bottom and around the heel. 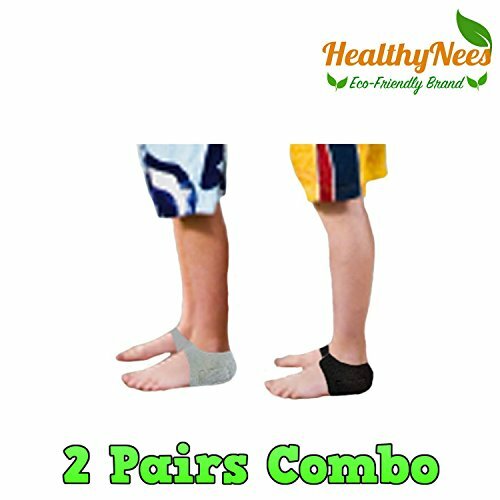 2 PAIRS COMBO SET - This Combo Set Includes 2 Pairs Of Black And Beige To Help Stop Your Kids Heel Pain And Walk Longer. HEEL PAIN CUSHIONING - With The Built In Gel Silicone, These Sleeves Helps Provide The Extra Cushioning For Your Kids While Walking Or Standing. ORTHOTIC HEEL SUPPORT - All The Protection You Need To Help Provide Sturdiness And Stability For Your Kids Foot. SHOCK ABSORPTION - These Helps Absorb The Shock With Each Step Your Kid Takes, Relief From Any Heel Discomfort And Pain. NEOPRENE WITH GEL SILICONE - Soft And Comfortable Support Of These Neoprene Sleeve Thats Thin And Fits Easily Into Any Shoes. Specially Design With The Gel Silicone Protecting The Bottom And Around The Heel. If you have any questions about this product by HealthyNees, contact us by completing and submitting the form below. If you are looking for a specif part number, please include it with your message.